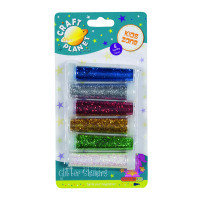 Get creative with this assorted pack of glitter shakers containing six individual colours. Ideal for classroom use, these glitter shakers are recommended for children aged 5 - 11. This assorted pack contains 6 glitter shakers in white, red, green, blue, gold and silver.